Last night I was kicking around on Facebook before crashing for the night and I found an article, 10 famous travel locations that DO live up to the hype. I looked through the article and had to laugh, the list was pretty similar to pieces I’ve read before entitled, 10 famous locations that don’t live up to the hype. The two on both lists included the pyramids at Giza and the Eiffel Tower. So hopefully not some huge spoiler for you, but the Great Pyramid of Giza is a half block from a Pizza Hut and the entire city of Giza, there’s garbage, there are tourist traps and scams that surround the pyramid. So one person’s list makes this place a huge disappointment. On the other hand this massive structure was built to exacting mathematical, geographic and construction standards thousands of years before anyone in the western world knew for sure North America even existed, so a person approaching it with that attitude sees an ancient marvel and is moved by the experience. The Eiffel Tower has similar reviews, if you have romanticized the idea of the Eiffel Tower, of standing alone upon the tower and viewing Paris, well, long lines, admission fees and tons of rude tourists might really kill the experience for you. However, the person writing last night’s article basked in the reality of just standing underneath such an amazing and iconic piece of architecture. The only difference between these being horrible let downs or amazing experiences were the writer’s expectations and attitudes. I’ve been experiencing this phenomenon a lot on my 2018 adventure. The first was my Camino Experience in Spain. I went into it with lots of doubts and not the best attitude and the universe helped me manifest an unpleasant experience. The opposite could be said about my time hiking in Scotland, where some bad weather, a huge blister, getting lost, getting ripped off due to a mistake by my tour company and some fierce midges at one point was a great experience. My attitude going into Scotland was sooo much better than my attitude on the Camino. Not that I didn’t have valid complaints about the Camino, but I would have been happier had I had a better attitude. For me Mexico has been a microcosm of the same issue. The trip in was stressful, I was tired and so things seemed overly negative. Happily as I talked about in a blog post about the trip, I was aware that the stress and lack of sleep were likely ganging up on me. Day 2 in Oaxaca was better, I was feeling more myself and had some time to do a bit of photography and look around after getting settled in. Today was much better, I have come to realize that the place I’m staying at for the first two weeks is a bit at the edge of the hood. This is not a revelation, the razor wire kind of gave it away, also for $12 per night you have to kind of expect you’re not in the center of the tourist section of town. Not to scare anyone, the neighborhood so far seems very safe and the place I’m staying is actually great and very secure. We’ll see how I feel walking home at midnight after my cemetery tour on Halloween night. However on my morning walk today, I decided to take a left turn and head for the big cathedral in the city which I see when heading down into the center of town. Once I got into that area it was a whole new world. Here was the Oaxaca you read about in the travel guides. The cathedral is surrounded by artisan markets, galleries, coffee shops and you’re walking on cobblestone streets. The restaurants are pretty and serve the traditional foods Oaxaca is famous for world-wide. I had to laugh, I instantly had an even better impression of Oaxaca than I already had. The apartment I have while in language school is actually located three blocks from the cathedral in this area. It was a great illustration of the effect of your perception, expectation and attitude really impacting your perceptions of a place. BUT, this is not the sole reason I came to Oaxaca and I’m happy for how things played out. You see the first night I arrived late and stayed in the tourist zone at a very nice hotel near the zocalo. 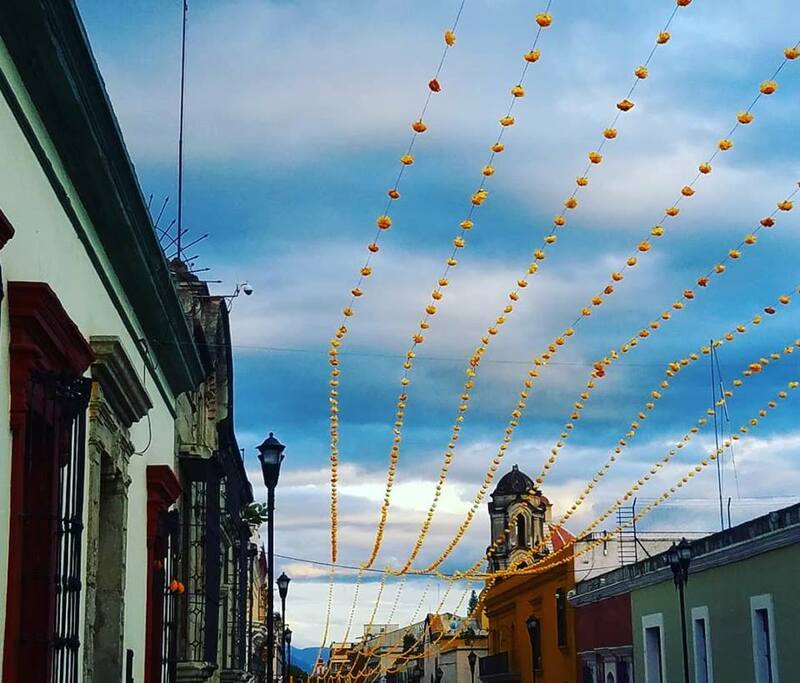 Riding in from the airport, tired and grouchy and through a rundown section of Oaxaca didn’t leave me excited. Walking to my current location I used Google Maps to give me the route to my place. And here’s the thing about Google Maps, I love Google Maps and it’s made traveling a hundred times easier than it used to be. However, there is no humanity or additional knowledge. The algorithm picks the “best” meaning the most direct route. It does not account for the types of things that also matter, how pretty is the route, how safe is the neighborhood you’ll be walking through, hills anyone? This entry was posted in 2018 Adventure and tagged adventure, attitude, Camino, giza, mexico, oaxaca, paris, scotland, travel. Bookmark the permalink.